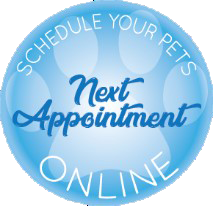 Ever considered buying your pet's medications from an online pharmacy? Please be careful! Read this article by the FDA to find out more...http://www.fda.gov/forconsumers/consumerupdates and check out this news report on the dangers of buying pet medications online: http://www.foxbusiness.com. Buy your pet's medications from us--we've got great manufacturer specials, manufacturer's guarantees & medications come directly from the manufacturer. And now we've got two different ways to purchase-in person when you are in the office next or through our online store! All specials are when doses are purchased per pet. Unfortunately, rebates will not be honored by the manufacturer if the product is split between pets in a family. Advantage Multi for Dogs: Buy 9 doses get 3 free, buy 6 doses get 2 free! Interceptor Plus: $15 mail in rebate with a one year supply & manufacturer's guarantee. 5$ mail in rebate with a 6 month supply purchase. Frontline Gold For Dogs: Buy 3 doses get 1 free, buy 6 doses get 2 free! New puppies get a free first dose of Frontline Gold! or $20 mail-in rebate with a 12 month supply purchase! Revolution: Earn rewards for the doses of Revolution you purchase! Go to to login, register and start earning your rewards! Simparica: Mail in rebate for 15$ off a 6 month supply purchase or 35$ off a 12 month supply purchase for your dog! Trifexis: 25$ mail in rebate with a one-year supply. 10$ mail-in rebate with a 6 month supply. Is Trifexis Safe? Check out this great article by the American Veterinary Medical Association about the headlines Trifexis made in November 2013 & again in Indianapolis in January 2015. More questions? Here is additional information from Elanco we feel our clients should have.